An annual view of the Budgets window, with drop down lists. 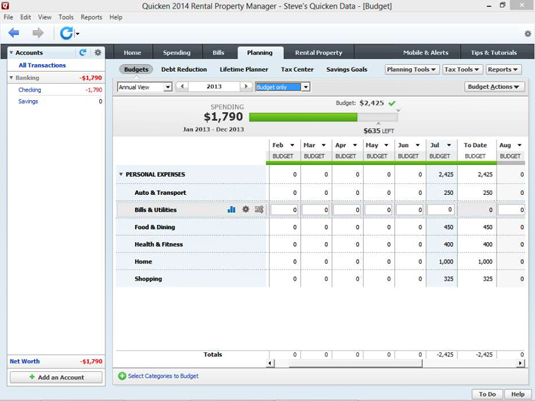 Budget name: If you’ve created several budgets, Quicken supplies an unlabeled drop-down list box in the top-left corner of the Budgets window. You use this drop-down list box to select the budget you want to review. Graph View/Annual View: The Graph View/Annual View drop-down list box lets you flip between the Graph View and the Grid View. 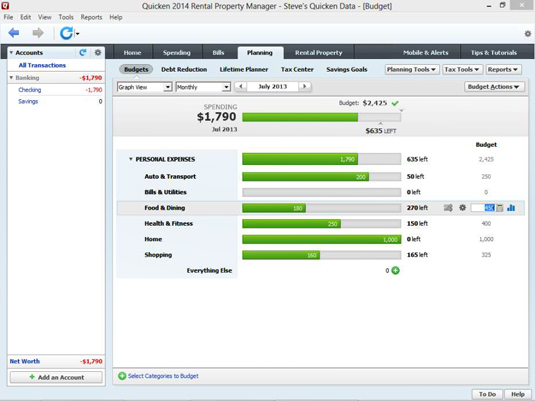 Interval: The unlabeled budgeting interval drop-down list box in the top-left corner lets you select the interval you are budgeting for: monthly, quarterly, yearly, quarter to date, year to date, and so on. Calendar: Finally, you use the unlabeled calendar box to select the specific month for Graph View. If you have any questions about what the unlabeled drop-down lists or boxes do, just experiment with the various budgeting drop-down list and box options. You’ll pretty quickly figure out on your own how they work.